I used to make patbingsu for my children when they were young. 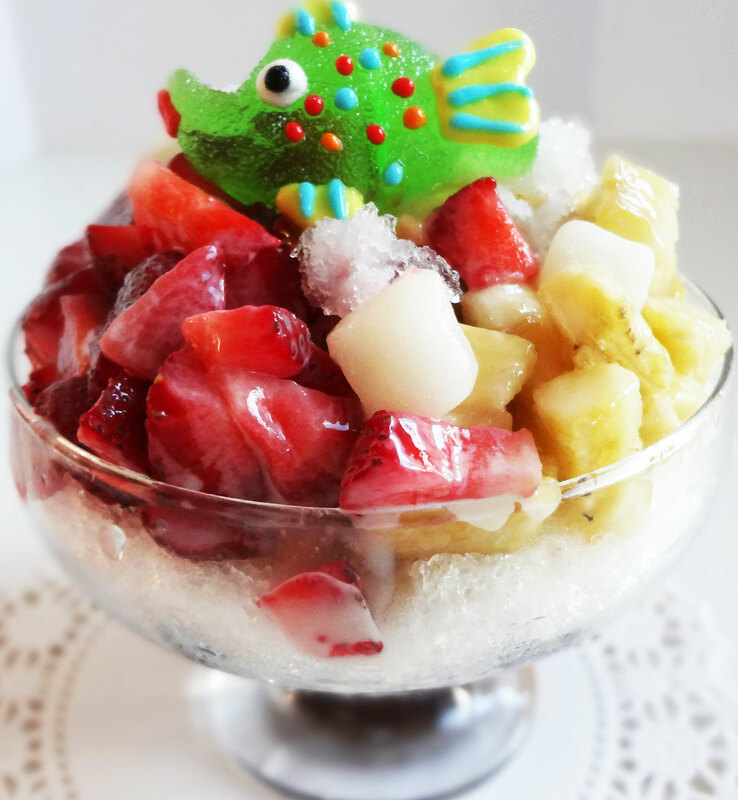 On a hot summer afternoon, when they came home from school, I would wait for them with patbingsu ingredients. Once they came home, “Patbingsu is ready! Wash your hands and come back to the table! Meanwhile I’m shaving the ice!” I was very happy when I saw their excitement. In this video, I’m at Google in NYC to attend YouTube Creators Camp. I was supposed to make 1 video during the camp, so I thought patbingsu was a good choice because it’s seasonal, refreshing, delicious, and easy to make if I prepare the sweet red beans in advance. I prepared patbingsu for 100 people. Here is the recipe for a much smaller portion. Enjoy the recipe! Red beans (adzuki beans), sugar, vanilla, salt, shaved ice, sweetened condensed milk, rice cake, strawberries, banana, and kiwi. I bought this reasonably priced electric ice shaver on Amazon. It’s quite simple and easy to use. If you are living in USA, you can get it delivered to your home. 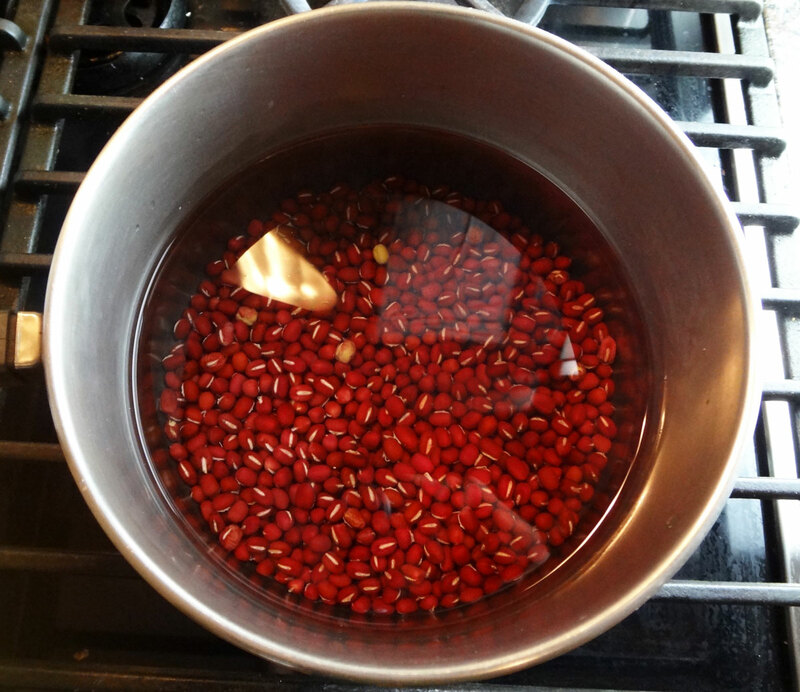 Rinse and strain 1 cup of red beans and place them in a thick-bottomed pot. 1 cup of dried red beans will make a little more than 2 cups of sweet red beans. 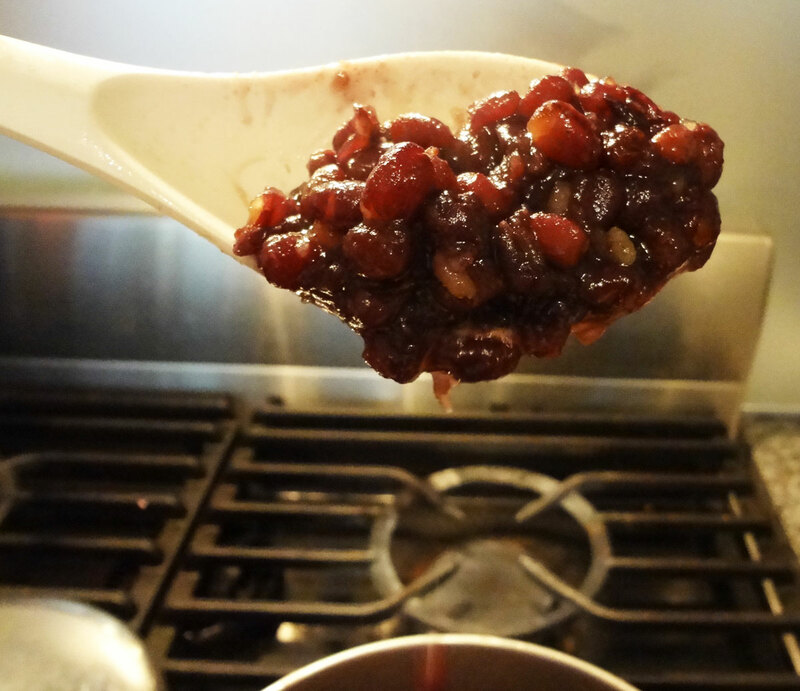 Each serving of patbingsu needs ½ cup of sweet red beans. Add 4 cups of water. Cover the pot and bring to a boil over low heat for 10 minutes. Lower the heat to simmer for 1 hour. Open the lid and check if the beans are cooked well or not. The beans should be crushed easily. Chew a sample of the beans. If there is something hard when you chew, you need to cook longer. Drain the water and add 1 cup of sugar, 1 ts vanilla, and ½ ts salt. Mix well. Uncover and stir the sweet beans over low heat for 5 minutes. Turn the heat off and let it cool down. Keep in the fridge. 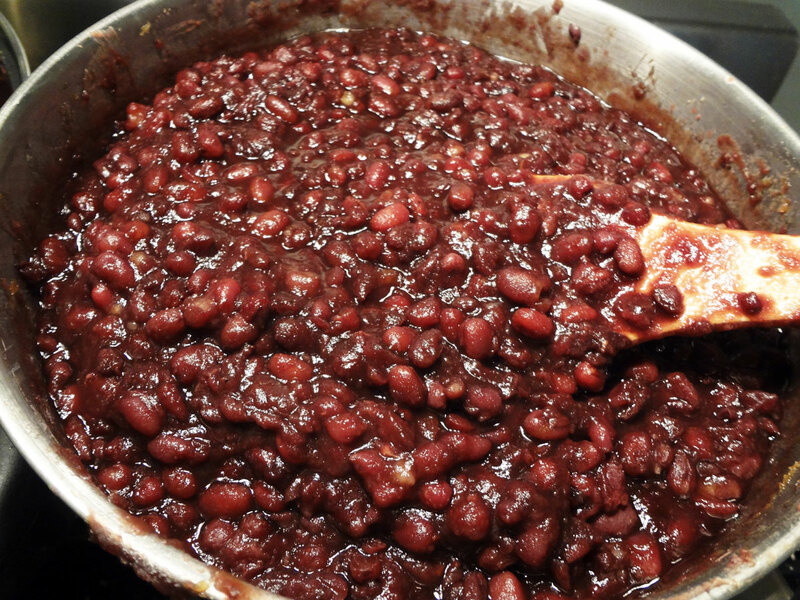 Add ½ cup of sweet red beans on the bottom of a dessert bowl. 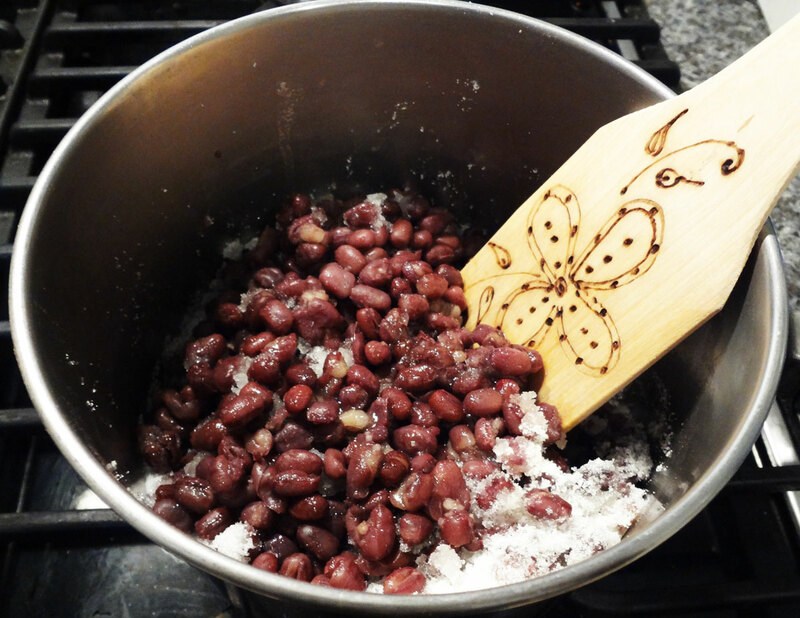 Add 1½ cups of shaved ice over the sweet red beans. Add chopped strawberries, banana, and kiwi on top of the ice. 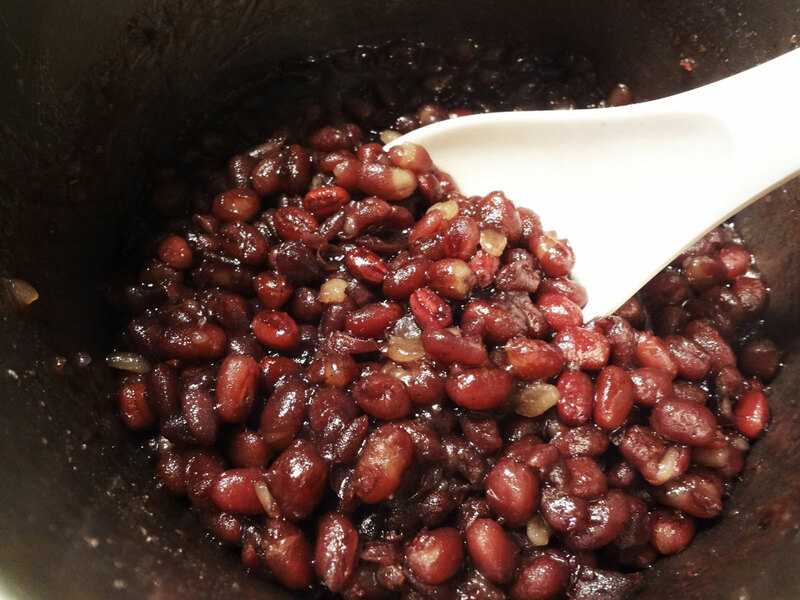 Pour 2 tbs of sweetened condensed milk onto red beans and place 5-7 chopped rice cakes on top. Serve right away with a spoon. Posted on Wednesday, June 1st, 2011 at 2:28 pm. Last updated on April 26, 2015. Posted July 11th, 2011 at 11:13 pm | Log in to reply. Hi Maangchi! What rice cakes do you use for the topping? Thanks, love you! Posted July 13th, 2011 at 9:17 pm | Log in to reply. Posted July 19th, 2011 at 10:11 pm | Log in to reply. Thank you so much! I am going to make this for our son’s baek-il next week, we are so excited!! You’re the best. Posted July 20th, 2011 at 7:57 am | Log in to reply. Posted July 10th, 2011 at 7:33 pm | Log in to reply. I am so excited to find this recipe. We ate it several times while on a trip to Korea a few years ago…and have been trying to learn how to make it ever since. Can’t wait to suprise my husband this week. Thank you! Posted July 11th, 2011 at 10:22 am | Log in to reply. Great! Let me know how your patbingsu turns out later. Posted June 24th, 2011 at 6:00 pm | Log in to reply. Posted June 22nd, 2011 at 2:19 pm | Log in to reply. I’m SO glad I found this recipe! Last summer I remember making PatBingSu, but everyone in my family loved it so much I used all of the sweet red beans I had bought. I haven’t been able to find any of the sweet red beans since, and after reading your recipe for homemade sweet red beans I’m excited I finally get to have PatBingSu again! Posted June 23rd, 2011 at 9:30 am | Log in to reply. Great! Let me know how your patbingsu turns out. Happy cooking! Posted June 15th, 2011 at 5:45 pm | Log in to reply. In high school, my friends and I would go to a little shop in Hawaiian Gardens in California called Ice Keki and they served this in HUGE portions. It was usually four or five of us that would split an order. They put cereal on theirs, Captain Crunch, Fruit Loops (my favorite), or Fruity Pebbles (my second favorite). They also had a chocolate version with chocolate shavings all over it. Oooo, I have to make it now; it brings back good memories! Posted June 9th, 2011 at 11:55 pm | Log in to reply. I’ve been dying to make this since you posted it. Maybe even before since you teased us on Facebook saying you were going to make it a week before the YouTube Creators Camp! I have no electric or manual ice shaver though! I bought the red beans today so I will just make the beans up and then get vanilla ice cream and some bananas! Not traditional but I’m just excited because I love sweet red beans! Posted June 5th, 2011 at 11:05 am | Log in to reply. What a fun dessert. I made the beans using small red beans I found in Harris-Teeter. The beans and fat-free condensed milk make a healthy dessert and very refreshing. Thanks for the recipe. Posted June 4th, 2011 at 12:50 am | Log in to reply. I love the dduk that you put on pat bing soo so much that sometimes the kids and I eat it up before we even make pat bing soo. We call the rice mallows. I am looking forward to making my own red beans for pat bing soo now. I will have to make a really big batch to have on hand for whenever we feel like eating this delicious treat. Posted June 4th, 2011 at 11:11 am | Log in to reply. Posted June 2nd, 2011 at 12:38 am | Log in to reply. 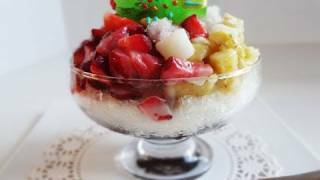 Maangchi, me and wifey have been enjoying patbingsu since we were dating and I would love to make her some from scratch. Thanks so much for sharing this recipe. I will definitely give this a try! Posted June 2nd, 2011 at 11:45 am | Log in to reply. oh, u guys were patbingsu couple! : ) I love your blog, too! Let me know how your patbingsu turns out. Upload the photo on my website if you want. Have a great day! Posted June 3rd, 2011 at 1:25 pm | Log in to reply. Maangchi We love your blog also :) We will definitely be in touch. I will be ordering the ice shaver machine soon from amazon along with some red beans from the Korean market by us in long island. Once we make our patbingsu, you will see it for better or worse.. lol hopefully it comes out as nice as your. Enjoy your day! Posted June 1st, 2011 at 9:24 pm | Log in to reply. Maangchi! Your recipes are great as always! Ooh, now I’m craving this dessert dish! I’ll have to try it out soon. Thanks! Posted June 1st, 2011 at 8:19 pm | Log in to reply. Out of all your recipe videos this was the most fun to watch. And let me say, wow, you have met some really good looking friends helping you to shave the ice – lol! 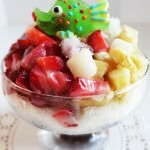 I am definitely going to impress my guests with your patbingsu recipe this summer. Delicious! Posted June 1st, 2011 at 9:39 pm | Log in to reply. Posted June 1st, 2011 at 5:21 pm | Log in to reply. Onni,,love this dessert..lol.We have this same concept dish from the Philippines we called it Halo-halo.Definitely,reminds me of summer..:-))Thank you for posting it!Your plating is always fabulous looking! Posted June 1st, 2011 at 7:29 pm | Log in to reply. haha, you left the same comment on YouTube? halo halo? : ) It sounds like hello hello. Do you add sweet red beans in it, too? Posted June 2nd, 2011 at 5:34 pm | Log in to reply. Posted June 1st, 2011 at 5:14 pm | Log in to reply. I really wanted to make this the other day and now I can! Thank you 8)! Posted June 1st, 2011 at 7:26 pm | Log in to reply. Posted June 1st, 2011 at 3:17 pm | Log in to reply. Maangchi this looks delicious! I especially like the little fish candy :) The video shows us how much fun you had at Creator Camp! In the picture under number 3 it looks like there is piece of butter in the pot with the beans – is that right? Also, in number 5 you say “1/2 cup of the 1 ts vanilla” but you don’t say what the 1/2 cup is meant to be of :) Do I need special rice cakes for this or do I just cut up the tube ones? This recipe was originally posted on June 1, 2011 at 2:28 pm by Maangchi. It was last updated on April 26, 2015. The video was watched 417,615 times on YouTube & has 3,872 likes!